On 2-July, 2010 The Ceremony of Honoring Presigious Brand and Golden Quality Product & Service was held at Hanoi Opera House. 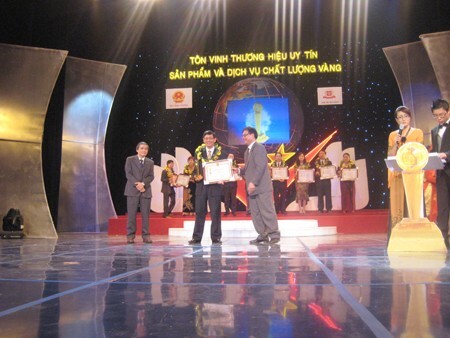 And TrungThanh was honored as one of 70 outstanding enterprises received the cup “ Prestigious Brand – Golden Quality Product & Service” in fields of service, product, contribution,... in Vietnam. Among those enterprises, there were top 15 for “Prestigious Brand – Golden Quality Product & Service”, top 25 for “ Sustainable Brand” and top 30 for “Prospective Brand”. The Ceremony was held by Ministry of Industry & Trade cooperated with Chau Giang Ad & Commerce Limited Company. The purpose of the Ceremony was to promote Vietnamese brands and encourage Vietnamese customers to consume domestic products. The cup “ Prestigious Brand – Golden Quality Product & Service” has partially confirmed the reputation and quality of TrungThanh in the market. This is also an oppotunity for of TrungThanh and other enterprises to approach customer more closely. In the future, TrungThanh commits to complete product & service quality to deserve the reward.